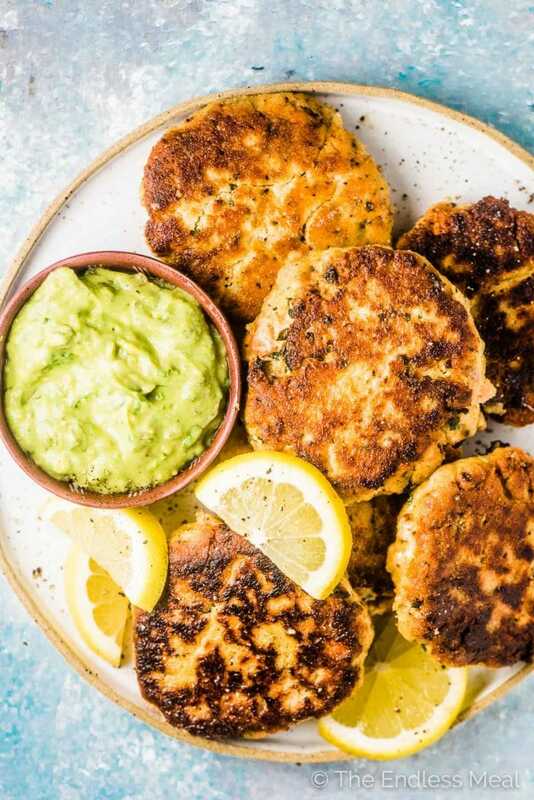 Salmon Cakes with Avocado Tartar Sauce is a quick, easy, and healthy dinner recipe made with fresh salmon. And if you make small salmon patties they are perfect for a party appetizer. These salmon cakes are super tender and flavorful. They are beautifully crisp on the outside (without using any flour!) and moist inside. Plus, you don't have to cook the salmon first. I'll tell you why I make them with raw salmon in just a minute. Spoiler alert: it makes the best salmon patties! Not only are these easy to make for a quick weeknight meal, but they're also great for meal-prep. Pack the leftovers with some of the avocado tartare and a handful of salad greens and lunch is made. Or make mini salmon cakes and serve them as an appetizer the next time you have friends over. Tender cakes. As you only cook the salmon once (unlike most salmon cake recipes) it doesn't overcook and dry out. Crispy edges. Because it's the crispy tender contrast that wins each bite. Made without flour. Because we know of an option that's better for us AND makes these salmon patties tastier, too. Win! 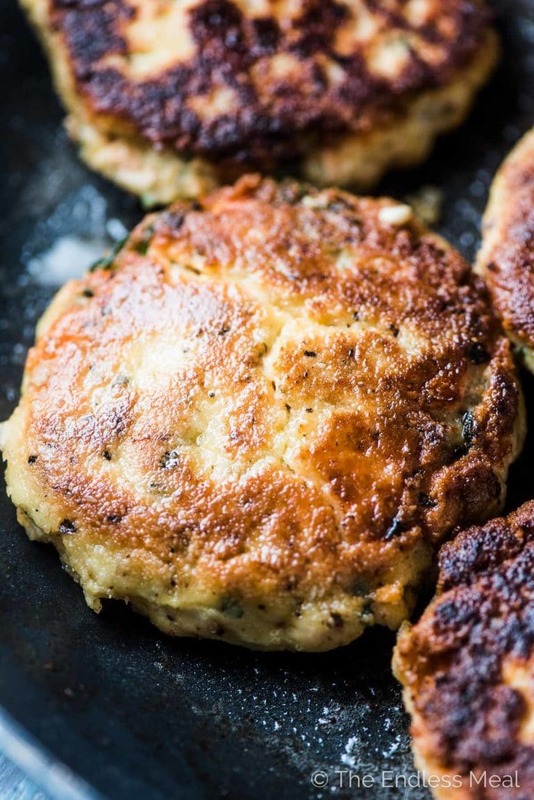 These fish cakes are so delicious that they don't even need a sauce. But since my family LOVES sauce, I always serve them with some avocado tartar. It's ridiculously good. 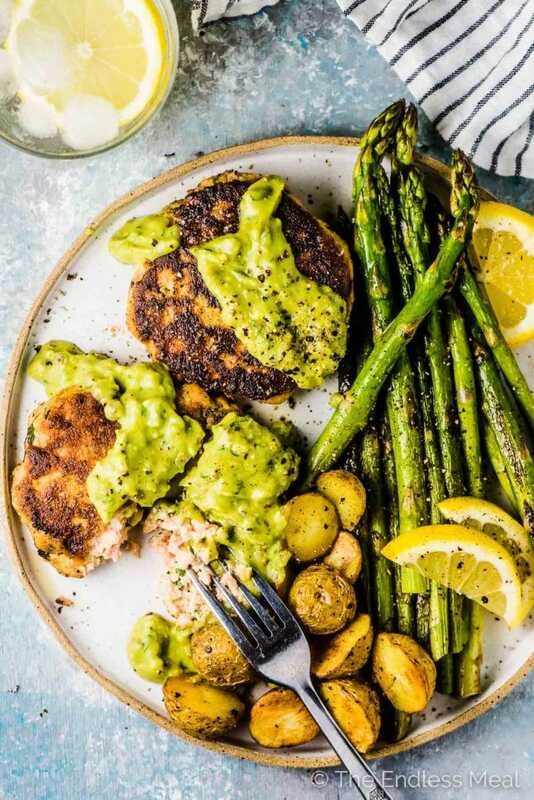 This is a gluten-free + Whole30 + paleo salmon cake recipe. But if you don't mention that, no one will ever guess they're healthy. It can be our little secret. These guys are really easy to make. There are 4 basic steps: chop, mix, form, cook. Chop the salmon into small pieces, just like in the photo above. If you need to remove the skin from the salmon, check out this Lemon Salmon Burgers post for instructions. It's pretty straightforward. Mix the salmon with the 5 other ingredients and a little salt and pepper. 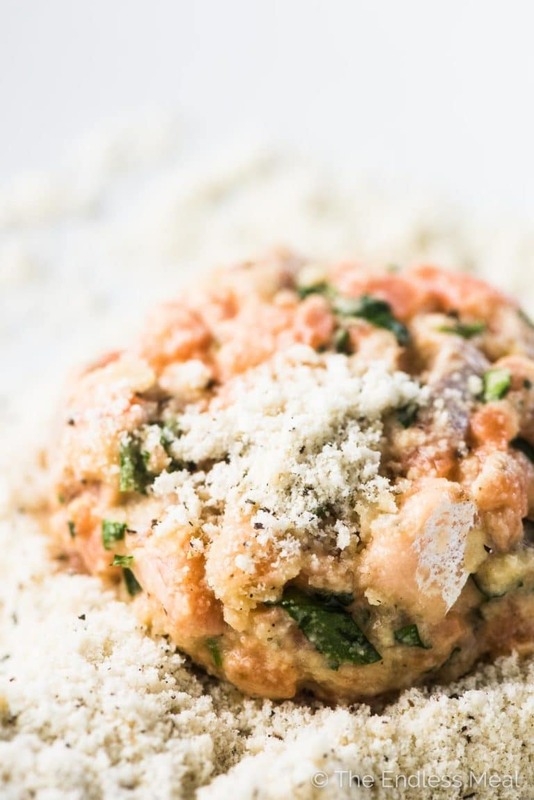 Scoop the salmon into a 1/4 cup measuring cup then carefully drop it into a bowl of almond flour. Sprinkle some almond flour on top then carefully lift it up and gently form it into a patty. Cook the salmon cakes for a few minutes on each side so they are crispy outside and tender inside. That's it! Making salmon patties is really easy. This recipe makes soft, tender fish cakes, which is what you want. If you can flip your fish cakes like they're hamburger patties without them falling apart then you might as well flip them straight into the garbage. There are two tips you need to make these easier to work with. Use a gentle hand. I can't stress this point enough. When you coat them in the almond flour, VERY gently pass them back and forth between your hands like a ball until a patty forms. Don't try to squish them into a patty or they'll fall apart. And when you place them in the pan to cook (and when you turn them over) be gentle. Let them rest for a little while after you form and flour them. I put them in the fridge while I prep the rest of dinner then take them out to cook 10 minutes before everything else is ready. This extra step makes them a little more sturdy. And remember, if they seem like they're just barely staying together before you cook them, you know they're going to be super delicious. Steelhead trout (ocean-going rainbow trout that tastes a lot like salmon) is a great, low-cost option. We buy it frequently and it's what you see in these pictures. In a pinch, you could opt for sockeye or coho, but know that they will make your salmon cakes a little dry. What the heck is avocado tartar sauce? I'm glad you asked! I love a good tartar sauce so was super skeptical the first time I made this. I didn't have high hopes but ended up being blown away by it. Instead of using mayonnaise or sour cream, this recipe uses an avocado. The trick is to mash it really well so it is creamy then mix in enough water so that it is the same consistency as mayonnaise. My family loves this healthy tartar sauce and I love that I can feel good about serving it to them. Line a baking sheet with parchment paper. 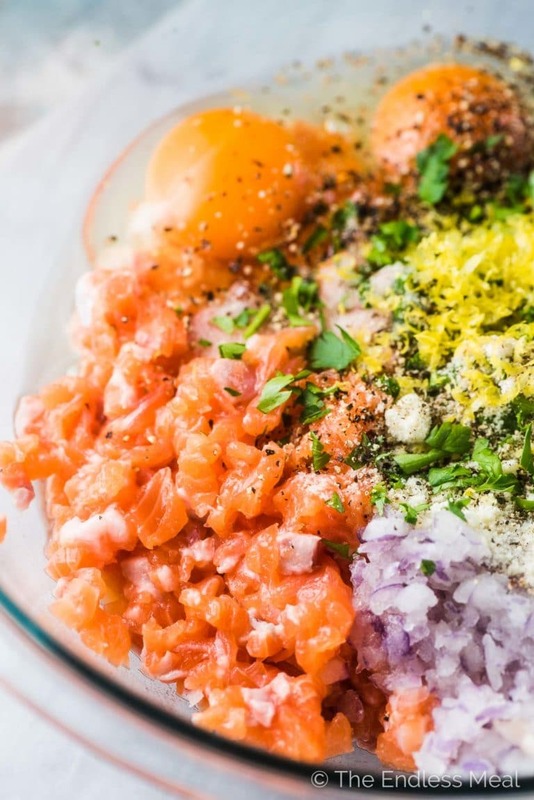 In a large bowl, mix the salmon, grated onion, parsley, 1/2 cup of the almond flour, salt, pepper, eggs, lemon zest, and juice. Place the salmon patty on the parchment lined baking sheet and repeat with the remaining salmon to make 8 patties. Put the cakes into your fridge, uncovered, while you make the sauce and prepare dinner. Heat the oil in a large, non-stick frying pan over medium-high heat. Working in 2 batches, add the salmon patties to the pan with the top side (dry side) facing down. Cook the salmon cakes for 4-5 minutes on each side, or until browned and cooked through. Be gentle when turning them over to prevent them from cracking. Using a fork, mash the avocado until it is creamy. Add just enough cold water (2-3 tablespoons) so that it is the consistency of mayonnaise. Mix in the remaining ingredients and set aside. Grating the onion means that you don't have to cook it first. Use the large holes on your grater. For a higher carb/ lower fat option, use tapioca starch or cornstarch instead of almond flour to coat the salmon patties. You absolutely cannot go wrong with anything salmon and this recipe looks AMAZING. What a unique idea using avocado for the tartare sauce. 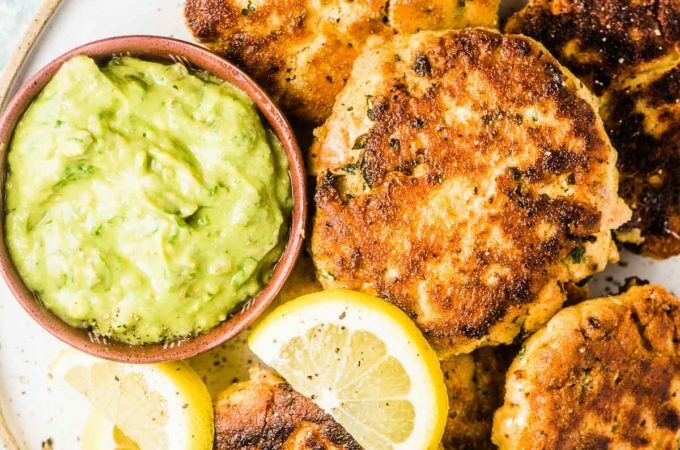 And the fact that you used almond flour makes these salmon cakes even better. Thanks for sharing. Could you use canned salmon for this?